LUSH & REALISTIC LOOKING ARTIFICIAL GRASS: Our fake grass looks just like the real thing! Thick and lush, our artificial turf grass features a variety of blade and thatch patterns in a multitude of natural colors to realistically mimic the natural patterns of natural lawns. No thin, fake plastic looking blades here. HASSLE-FREE LOW MAINTENANCE: Unlike with natural grass or sod, your artificial grass dÃcor doesnÃ¢ÂÂt require watering, lawnmowing, fertilizing, or pest control! Built-in drainage systems ensure that you only need to hose down your artificial grass turf on occasion to keep it clean. CHILD AND PET-FRIENDLY: UltraHedge artificial grass mats make an ideal grass for dogs and children. ItÃ¢ÂÂs 100% lead free and greatly surpasses government testing requirements for safety, making it completely safe for use with your young ones! ItÃ¢ÂÂs also ideal as an artificial grass dog potty or pee pad, as an alternative to standard potty pads or lawn soiling. HIGH QUALITY THATÃ¢ÂÂS BUILT TO LAST: Our artificial grass is perfect for indoor or outdoor use, and is designed to withstand rough play, wear and tear, and changing weather conditions. With normal use, our artificial grass can last 20-25 years! ENVIRONMENTALLY CONSCIOUS: Artificial grass green makes a great eco-friendly alternative to live grass lawns! It doesnÃ¢ÂÂt tax soil and earth like live grass does, and it doesnÃ¢ÂÂt require harmful pesticides nor large amounts of water to upkeep. Its long lifespan also reduces waste, and all of our artificial grass mats are made of recyclable materials. UltraHedge artificial grass yards look just as real as living grass. While some faux grass may appear too uniform, fake, or sparse, UltraHedge features a spectrum of natural colors, as well as varying blade and thatch patterns and lengths to accurately simulate live lawn grass. No watering, no mowing, no pesticides! Artificial garden grass requires very little maintenance compared to real grass lawns. Thoughtfully-designed drainage systems built into each artificial grass rug ensures proper drainage and minimal care; simply wash occasionally by hosing down the lawn. No regular watering is required, no mowing or trimming, no fertilizing, and no weed control or pesticides! Our grass is absolutely lead free and is completely safe for use by children and pets, dogs, cats, and even in aquariums! 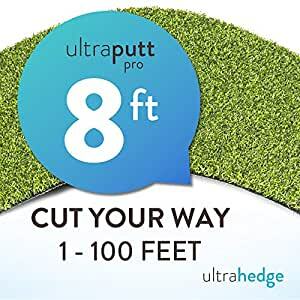 Great for yards, parks, putting greens, and more! Artificial grass green, whether small, large, long, or tall, has an incredible variety of applications. Outdoor artificial grass is great for golf putting greens, soccer, baseball, football sports fields, unique landscaping projects, playgrounds and parks, and child and pet-friendly backyards and front lawns. Indoor artificial grass is great for mini golf, indoor sports facilities and gyms, children’s playhouses and play rooms, daycares, and even as reusable pet potty pads. We are one of the largest manufacturers and distributors of artificial grass turf in the US. We carry over 48 types of synthetic grass and turf for landscaping, pet use, playgrounds, putting greens, sports fields, and more! With an impressive inventory that spans warehouses across the US, we can offer some of the most competitive pricing in the industry! Let us work with you on your own personalized projects-we’ll help you find the best price and product for your individual needs.